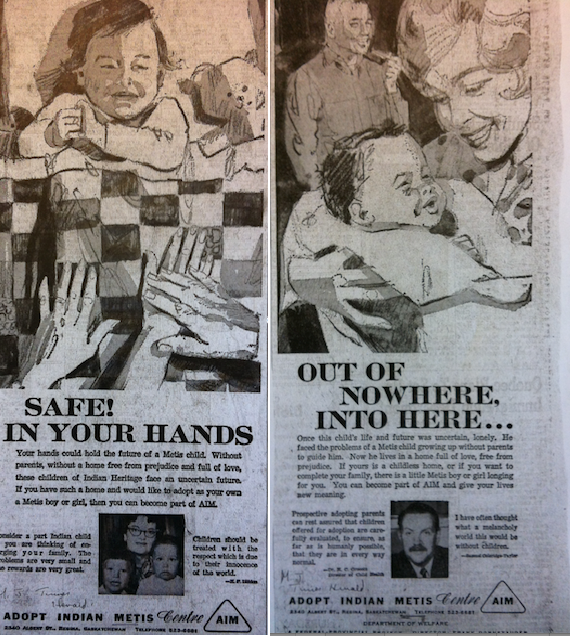 Newspaper advertisements for the Adopt Indian and Métis Program, late 1960s, Saskatchewan. Recently, the Sixties Scoop has been in the news. On October 6, 2017 Minister of Crown-Indigenous Relations and Northern Carolyn Bennett and Chief Marcia Brown Martel announced that an agreement-in-principle had been reached to settle the claims of Indigenous children removed from their families during the 1960s and 1970s. Status Indian and Inuit children from across Canada removed between the years 1951-1991 were eligible for compensation from the federal government for the loss of their culture during the time they spent in non-Indigenous foster and adoptive homes. One striking aspect of the agreement was the lack of recognition of Métis children who similarly experienced a loss of culture, family connection and sense of belonging. Ottawa asserts that during this period, it was the provinces that were responsible for the Métis, not the federal government. The removal and subsequent adoption or fostering of Indigenous children in non-Indigenous homes was a result of increasing child welfare intervention into First Nations, Métis, Inuit families and communities. The “overrepresentation” of Indigenous children among those removed from their families reflected a complex mixture of historical factors: paternalistic professionalism of social welfare experts, provincial child welfare legislation that unfairly targeted Indigenous families, jurisdictional disputes between federal and provincial governments, gendered discrimination in the Indian Act, poverty and discrimination, the impact of residential schools, and Indigenous dispossession. In 1969 Indian and Métis people made up 7.5 percent of the population of Saskatchewan, however 41.9 percent of all children in foster homes were Indian or Métis. The lack of child welfare services on reserves meant that provincial workers only apprehended children if a child’s life was in danger. However, adoption was available both on and off reserves. Social workers recognized that Indigenous children who were apprehended and remained wards permanently would likely never return home to their original families or communities. Rather than facing a life in foster home limbo, social work professionals in Saskatchewan saw the solution in securing “normal” white adoptive homes, professionally selected and screened, to provide proper socialization for these kids. From 1967 to 1969, the province of Saskatchewan piloted the Adopt Indian and Métis Project as a targeted program to increase adoptions of overrepresented native children. The project was funded initially by the federal Department of Health and Welfare to determine if advertising Native children on television, radio and newspapers across southeastern Saskatchewan would induce families to investigate transracial adoption. The piloting of the Adopt Indian and Métis Program in 1967 called for little financial investment and did not require extensive negotiation between federal and provincial governments or a radically new approach to resolving the underlying economic and social factors contributing to increasing numbers of Aboriginal children coming into provincial care. The imagery of the commercials and messages used to promote the program had a two-fold impact on Saskatchewan residents. On one hand, it successfully stimulated interest in transracial adoption as planned. Many Euro-Canadian Saskatchewan families were quick to embrace the idea that Indian children were no different than any other child. In 1970, the Department of Social Welfare broadened the focus to all children who needed placement. But not everyone viewed the Adopt Indian Métis ads with such admiration, or agreed that Aboriginal children should be placed white adoptive homes. The Métis Society, located in Saskatoon, undertook a campaign in 1971 to challenge the images utilized in the ads. That year, the Society formed the Métis Foster Home committee, led by Howard Adams and Métis activists Phyllis Trochie, Nora Thibodeau, and Vicki Racette to research the creation of a Métis-controlled foster home program. The group had a list of eleven reasons that the current government-run system was detrimental to children, parents, and the Métis community as a whole. Their objections centred on the lack of acceptance of Métis identity and citizenship by both white foster parents who raised the children and the larger white society in which the children were being raised. They claimed, furthermore, that “Past experience with the welfare department has proven that it is unable to treat Métis people as equal and full citizens and any new foster home plan under the welfare department would continue to be administered in a repressive and discriminatory way.” While the discourse of equal treatment and color blindness permeated official pronouncements by the department, Métis and Indian people drew upon their own collective experiences of discrimination to formulate their position on child welfare. The Métis society specifically targeted the advertising campaign that had been the primary function of the AIM program. Their letter charged, “These ads are racist propaganda against the Métis and Indian people.” A list of nine reasons followed that spelled out how Indian and Métis people perceived the advertising of their children. First, the ads implied that Métis parents were unable to look after their children; second, they degraded Aboriginal children as inferior and unwanted. To the Métis community, the ad campaign was objectionable because ‘it portrays our people and nation as being weak because we are portrayed as begging white people to take our children.’ The society claimed that AIM created the public impression that Métis children were ‘so unwanted and ugly that the government has to make great efforts to find some kind of home for them.’ Further, it suggested that the children were so desperate for homes they would accept any white family who was sympathetic enough. In addition, the group objected to having Métis children being shipped out of the province of Saskatchewan for adoption into white homes in other provinces. My grandfather was one of the founders of Buffalo Narrows, was a justice of the peace for 20 years, had a huge library in the middle of the northern Saskatchewan bush…One day I was in the archives, and I found a picture of him with a caption that that reads, “happy Métis grandfather with his 13 grandchildren.” Except one. I started bawling, and the archivist came there, and asked, are you ok? I said, ya! It’s kind of a sad crying and happy crying, because I finally got to see who my grandfather was. The programs and policies that were administered by the Department of Social Services were operated under the paternalistic Euro-Canadian belief that the Child Welfare bureaucracy and family courts alone could interpret the “best interests of the (Indigenous) child.” Métis people in Canada have a long history of child removal, and in Saskatchewan, were the first Indigenous peoples to recognize the genocidal threat of child removal to their future. The recent exclusion of the Métis children from the federal compensation agreement for the Sixties Scoop is reminiscent of Canada’s original disregard for the Métis peoples, which stretches back to 1869 and beyond. Allyson Stevenson is a Post-Doctoral Fellow at the University of Guelph. She completed her PhD, Intimate Integration: A Study of Aboriginal Transracial Adoption in Saskatchewan, 1944-1984 in 2015 at the University of Saskatchewan. She is an adoptee. Robert Doucette Interview, October 10, 2012. Annual Report, Department of Social Welfare Government of Saskatchewan 1968-69, Government Publications, SAB. Director of Program Division, W.K. Morrissey to A.W. Sihvon, Deputy Minister, January 4, 1972, from Draft AIM report originally known as KIN, Collection R-935, Saskatchewan Department of Social Welfare, File 49 (4.9), Adopt Indian and Métis Program, AIM, 1967-1973, SAB. December 1971, Métis Foster Home Plan Collection R-935, Saskatchewan Department of Social Welfare, File 49 (4.9), Adopt Indian and Métis Program, AIM, 1967-1973, SAB. I don’t think anything I’ve read to date has brought home to me the awful legacy of colonialism with the impact this piece has. The ads below, used to illustrate the article, are appalling. Yet the truth — and the real dilemma for non-Indigenous Canadians — is that when these ads ran (in the 1960s), they would have seemed to most Canadians (if they thought about it at all) as a good – even noble – enterprise.